Ladoo is a favorite prasad in the Indian homes specially during festival times. Coconut ladoo is my favorite . But the traditional recipes takes a lot of time and when in hurry try this ladoo recipe. This ladoo can be whipped up fast and the condensed is the secret ingredient. Set aside 1/2 cup of coconut . Add three drops of red color in part and mix well . Heat the condensed milk in a heavy bottom pan. Add the coconut and keep mixing for 4-5 minutes on low heat. Add the cardamom powder and mix well and remove from fire. Divide into two parts and add three drops of red color in one half. Take the dry coconut set aside in step I in two separate plates. Make small balls of coconut mixture from step II. Roll each white ball in pink colored dry coconut . 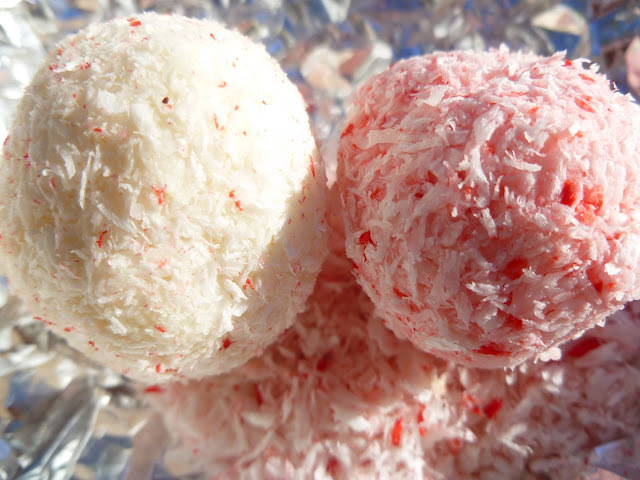 Roll each pink ball in white colored red coconut. And you are ready to serve. Store in the leftover in refrigerator . These lados look really cute and pretty.Thankyou for sending them to Lets cook with coconut event @ simply.food.